A $500 scanner sounds like $400 too much. But the “NeatConnect” is so useful we’re going to buy it. This is our ultimate test for any product: can you sell it to us? We got the NeatConnect for review a few days ago, and it became indispensable almost immediately. 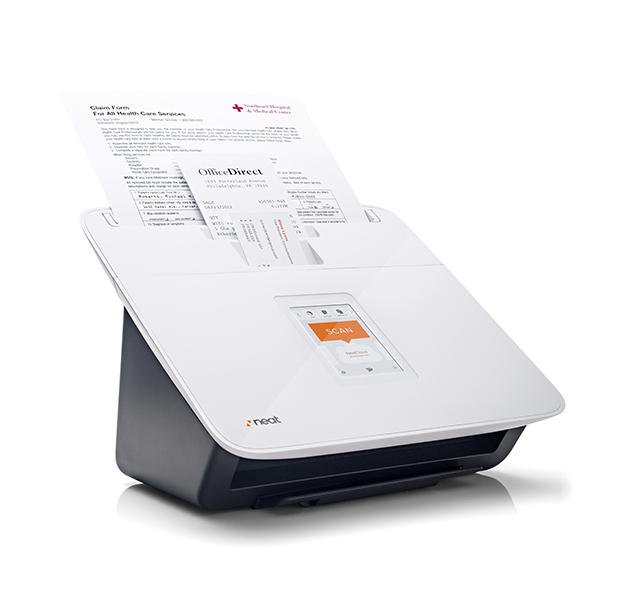 It’s about the size of an ink-jet printer and can sit on a desk or counter. 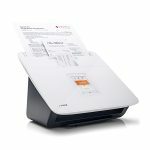 It has three slots: one for receipts, one for documents and one for business cards. We did the setup and then put three crumpled pages into the document slot. In a few seconds they landed online in our Microsoft SkyDrive account. (These are free.) The connection is wireless. You don’t need a computer to use this thing. Just put the paper in (up to 50 sheets at once if you remove a magnetic guide, otherwise 15 sheets) and off they go into whatever online account you’ve designated. It was so much fun, we started looking for old papers to scan just so we could feed this magic maw and get rid of some clutter. That’s how we found a prescription we’d forgotten about. Then we scanned a few precious photos. Ideally, we’d place this in the kitchen, so market receipts could go in when we unloaded our bags. But we have little space there, so it went on a small secretary desk. The NeatConnect stores documents online to Google Drive, SkyDrive, Box, Dropbox, Evernote or the “NeatCloud.” Slide your finger to the left of the small display screen to cycle through all your choices. You can also have documents automatically sent to an email address. The nice thing about using Neat’s own cloud is that you have a chance to categorize the papers in multiple ways and then it goes into its own folder. The bummer is that the NeatCloud online storage has an extra charge of $6 a month for personal use, $15 for business. You get a three month free trial of that storage site, and of course when your trial is up you don’t have to continue. Business users can use a mobile app for editing documents from a phone or tablet.